So, when in Jamaica, why not participate in this great event? Ok, it isn’t exactly bobsledding, but it’s pretty dang close! After all, the original team got its start from pushcart races, so you have to start somewhere! 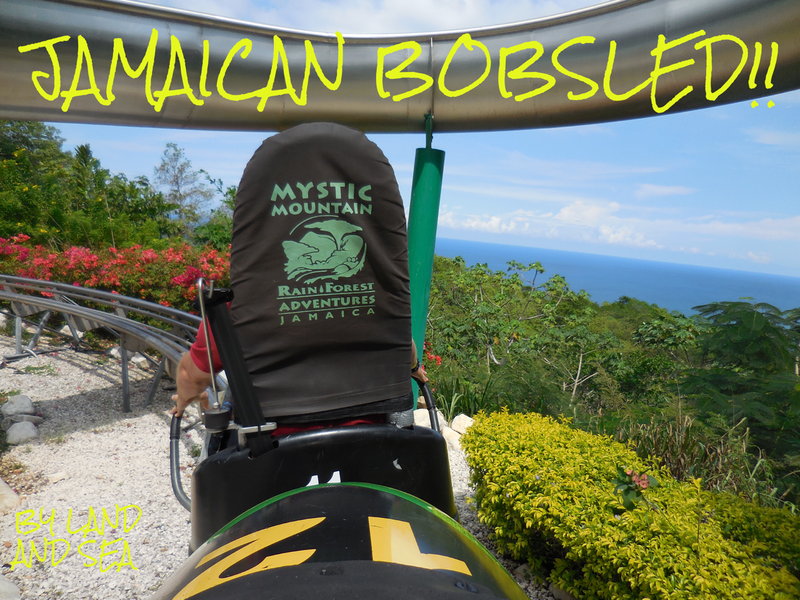 Outside of Ocho Rios is a fun little stop called Mystic Mountain. Here not only will you find bobsledding, but you can enjoy a small museum, infinity pool with sweeping views of Ocho Rios and the Caribbean Sea, and even have lunch and drinks. The ride to the top of Mystic Mountain is an old ski lift. Although this lift goes about 70 feet in the air, it has a little safety bar for an added sense of security. Just sit back and enjoy the ride! Where else can you take a ski lift to the top of a mountain in the middle of a lush, tropical rain forest? The bobsled ride itself is so much fun!! There are two sleds hooked together – one controls the brake (and therefore the speed) and the other car does nothing but get pulled along for the ride. I picked the back car because I wanted to take pictures. When we were about to get pushed out onto the track they asked us how fast we wanted to go… Just a note that if you tell them you want to go “really fast”, they will gather up a few more guys to have more manpower pushing you down the track. We went really fast and my hubby didn’t hit the brakes once! What a ride!!! You will rush at top speeds down the mountain, through the rainforest, and race around curves and corners at speeds that rival many rollercoasters. Some of the dips and dives literally take the breath out of you! It was so much fun, I couldn’t stop laughing the entire way down! At the end, your sleds will be hoisted back up to the top where you can ride again (for an reduced cost), have lunch, or just relax at the pool and slide. When you’re ready to leave, just take the ski lift ride back down the mountain! As a tip, this ride is short. If you are going to Mystic Mountain from Montego Bay, anticipate over an hour drive each way. There are other activities in the area you might be interested in doing as well like zip lining and climbing the infamous Dunn’s River Falls. Many of these items are offered in combo tours and are all things you must try, especially Jamaican bobsledding!! Three Simple Ways To Conserve Water While Traveling. I don’t think I’ll ever get to Jamaica (I’m not much of a traveler) but it certainly looks … exhilarating. LOL My children loved watching your video and made me play it twice. I’m so glad they liked it! Thanks for stopping by and commenting! Strewth, you wouldn’t catch me doing this, I’m way to much of a chicken! Not on your nelly … but my hubby would absolutely love this, he would also be asking to go “really fast”. In truth though, the views you see would be lovely, it’s just a shame I would probably cry like a baby all the way around! When we return to Jamaica, will have to check this out (well, the hubby will, I can just enjoy a picnic!) Thanks for sharing! But you went skydiving! If you can do that, you can do anything!! Wow!! Mr. Nerd and I just booked our Christmas vacation in Jamaica (eeee!!! ), and we had no idea this was a thing. I don’t think we’ll be able to make the trip to Ocho Rios this time (we’re staying in Montego Bay), but this looks right up our alley. The scenery on the way down looks beautiful! Kudos for getting the pictures; I can’t imagine taking photos while flying down the mountain. 🙂 Thanks for sharing! We were in Montego Bay and did tons! You will love it!! Let me know if you have any questions!! I have a few blog posts about Jamaica! Just search my #Jamaica tag and they will pop up. Rick’s Café at sunset is an absolute must! Personally, I loved Nine Mile because I’m a die hard Bob Marley fan – it was very moving for me! Dunn’s River Falls is also fun!! And, there is glowing lagoon you can swim in at night too! There is just so much to do! It was so much fun. This is really close to Dunn’s River Falls too! I actually got really bad vertigo at the beginning of climbing the falls and didn’t think I was going to make it! Thankfully once I got passed one point I was fine. It is sketchy in some spots for sure. Thanks for pinning and commenting! I would so do this! This looks like a blast. I had heard of it but never talk to anyone that tried it. Good for you guys. Your video is pretty cool. I will put this one on the do list for sure. Interestingly, this wasn’t at all crowded. A lot of people must not know about it or do it! It was so fun!! So Cool! Cool Runnings is one of my favourite movies, so I’d happily to do anything even loosely related to it. Plus, who doesn’t want to see the rainforest. I will admit that Cool Runnings makes me cry – I couldn’t pass up the opportunity to have my own little semblance of a Cool Runnings experience! And yes, the rainforest is spectacular and it is so fun to blast through it! This is so random and cool! Love the idea and I would ask if I could go really really fast! Made me smile – thanks for sharing! This made me smile, looks like great fun!! and what a bonus seeing the rainforest from a different perspective! Ha-ha, I remember the announcement very well that the bobsledding team would participate in the winter Olympics. Great activity as a memory, too! It was so much fun and I’m so proud that the country didn’t take no for an answer! Haha, tip: walk with an umbrella, because rainforest rain is no joke! Got caught in heavy showers last time I was here and just had to enjoy the soaking. The bobsled is really fun, especially when you are a little ‘chicken’. The zipline, however, is my favourite part of Mystic Mountain. You are right it is no joke! We got caught in a storm there too which caused almonds to fall on our heads and that hurts!! Sorry to hear, but things like that make storytelling a bit more interesting. Yes, it does. And we laughed! Never had an almond hit me on the head before!